The madness of the west is ever increasing as anti-Russian hysteria has spread from America to Europe in the wake of the farcical Skripal affair. The alternative media is under attack, journalists are being slandered, social media is being censored, apathy and ignorance are on the rise. The empire is out for blood threatening everyone who dares to resist and endangering the planet with it’s temper tantrums. Soft coups are sweeping Africa while the soft coups that took place in Latin America in places like Brazil, Argentina and Honduras are turning ever harder as President Lula is being locked up and dissent is brutally crushed in Honduras over a stolen election backed by the US. Ukraine is becoming the poster child for the empire of Chaos with the comedic downfall of former Georgian president turned wanted fugitive turned ruler of Odessa Mikhail Sakashvili. Palestine is on fire as resistance to the brutal apartheid system is being suppressed with murderous glee by the Israelis. Syria has won another stunning victory but the empire has announced it plans to steal a third of the country to create a Kurdish puppet state. America murdered over 100 SAA heroes in a vicious attack earlier this year February 7 to make this point clear. Now it has staged yet another phony chemical weapons attack as an excuse to launch a cowardly attack on Syria yet again. 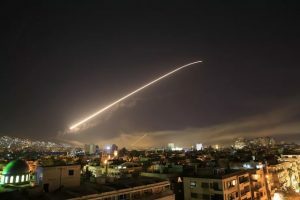 Thankfully last weeks attack was much less effective as the SAA managed to intercept 71 out of 103 missiles while the people of Syria showed their heroic defiance yet again the next day as they took to the streets to celebrate their victory over America and it’s French and British lackeys. Before turning to Syria however, I should discuss the event the recent phony chemical weapons attack and failed attack on Syria were designed in part to distract from. Israel’s latest war crime in their endless criminal war on the people of Palestine. Provoked by Mad emperor Trump’s recognition of Jerusalem as Israel’s capital in defiance of the rest of the world but in line with a goal pursued for decades by the powerful Israel lobby. Thousands of Palestinians risked their lives in a massive protest demanding their right of return. 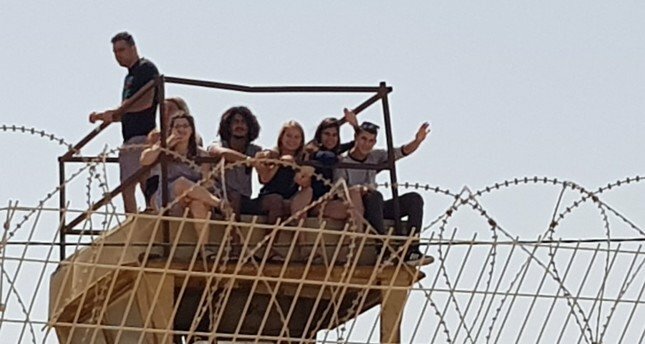 As they approached the “borders” of the world’s largest open air prison on April 3 they were met by a hail of gunfire from Israeli snipers that left 17 dead and injured 1,400 people. The monstrous Israeli’s bragged that they knew where every bullet landed relishing their role in a premeditated cold blooded massacre. This massacre of course provoked outrage around the world. Israel has already lost the stranglehold it once held over public opinion and in a panic is passing laws around the world aimed at censoring academics and criminalizing dissent especially calls to boycott their criminal apartheid regime. While one wing of the Neo-cons lead liberals on an endless Russia gate wild goose chase courtesy of Bill Kristol and the alliance to secure democracy, Another wing is rejoicing in having the most pro-Israel president in US history Trump who has turned American foreign policy over to the racist madman John Bolton. However whatever the machinations of the Israelis and Americans Palestine continues to resist against seemingly hopeless odds. They need the support and solidarity of the rest of the world. Israel has become a giant laboratory for researching the crushing of the human spirit if capitalism and imperialism continue to run rampant by the end of the century most of us will be living like the Palestinians as the planet becomes one giant open air prison designed to protect the haves from the have nots. Syria has continued to liberate more of it’s territories from NATO’s terrorist death squads. Most recently the suburb of Eastern Ghouta was finally liberated. Ghouta was made famous when terrorists staged a sarin gas attack on children they had kidnapped back in 2013 nearly bringing about the destruction of Syria as Obama was about to launch a massive attack aimed at completely crushing Syria’s defenses and allowing NATO death squads to seize Syria as they had seized Libya two years before. Russia averted this catastrophe with it’s Navy poised to intervene on Syria’s behalf and with a last minute diplomatic deal whereby Syria agreed to give up it’s chemical weapons. Unfortunately NATO and the GCC continued to supply their death squad’s with the materials to make chemical weapons. Even more unfortunately a gullible and amnesiac public seemed to forget all about the fact that Syria no longer had chemical weapons and so the same game has gone on. Mainstream news consumers are the victims of endless psychological warfare and have become completely detached from reality. Thus it is sickening but unsurprising that people were actually willing to believe in this latest attack. The terrorists were in such a rush this time that they didn’t even stage a real attack instead they staged a simulated attack and filmed the results. It has since been debunked but of course no one who actually follows events in Syria via independent media would be fooled into believing this nonsense in the first place. Ghouta had been under terrorist occupation for years and was the base from where they shelled Syria’s capital City of Damascus targeting schools, hospitals, and marketplaces to terrorize the Syrian people and punish them for remaining loyal to their country. Rumor has it that Ghouta was also being prepared as a staging area for a massive surprise attack on the Capital. This was why Syria shifted it’s attention from liberating southern Idlib from the terrorists and towards Ghouta . Supposedly British special forces were captured while the SAA was liberating the suburb. 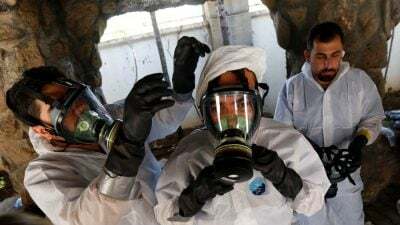 A chemical weapons factory was also exposed in the process. More importantly of course tens of thousands were finally allowed to escape from terrorist occupation. The Russians managed to foil a plot to blow up the buses using suicide bombers in a scheme that doubtless would have been blamed on the Syrian government. Finally the SAA managed to liberate the town and were greeted by the cheers of the locals. Of course every victory for Syria further enrages the empire and it’s allies. Hence the staged chemical weapons attack and the rush to launch an attack before an investigation could expose the fabricated incident. The whole world was kept in a state of suspense as the US and it’s allies massed their forces for an attack and the world was on a dangerous precipice. Thankfully because of the Russian intervention Syria is no longer in the vulnerable position it once was back in 2013. The terrorist death squads have mostly been destroyed or forced to flee to Idlib or other tiny pockets. Syria’s skies are protected by the Russian and Syrian Air forces. Thus instead of a decisive all out attack America, France, and Britain were forced to negotiate behind the scenes to launch a limited attack or risk a Russian response. Even more humiliating for the empire the SAA managed to shoot down 71 out of 103 missiles themselves using 70’s era soviet equipment. It was a victory over the skies of Syria with three once mighty empires defeated by Syria for all the world to see. The next day the people of Syria were out in the streets singing, dancing and celebrating their victory and demonstrating their fierce loyalty to their country. Has there ever been a people so full of life and courage? Once again Syria has become an inspiration to the world. Friends of Syria the world over share their joy. Unfortunately not even the mainstream media which specializes in ignoring the Syrian people (Unless they are on the payroll of some CIA funded NGO) could fail to see the defiance of Syria and the empire is already plotting it’s revenge. In fact even as I write Israel has lunched yet another attack on Syria which appears to have also met with failure. Israel of course launched a sneak attack in advance of the main NATO attack last week. Even more dangerous then the next attack is the continued American occupation and attempted theft of northern Syria aimed at Syria’s oil, water and farmland. The war in Syria will go on seemingly endlessly like all America’s wars aimed at causing as much chaos and misery as possible in the world. But the people of Syria, of Yemen, of Palestine will never stop resisting and neither should we.